School Them is a team made up of Teachers from Primary, High School and College levels. 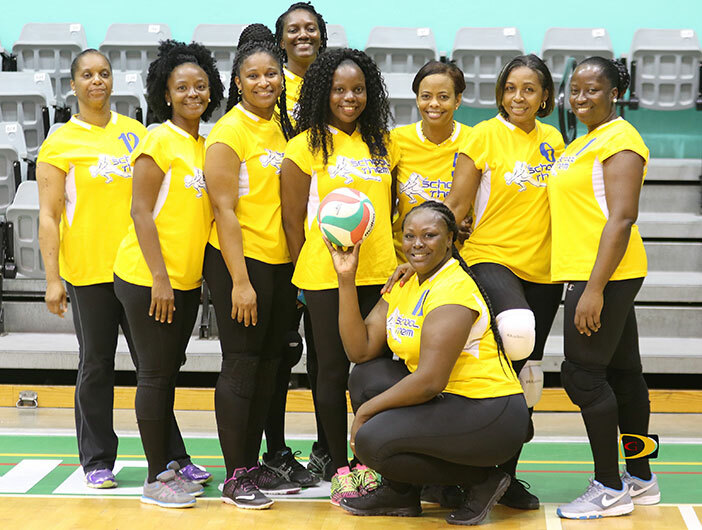 A strong serving performance by Virgin Gorda Eagles’ Daphne Sprauve helped them improve to 4-0 in Division II of the BVI Volleyball Association Power League, after romping to a straight set victory over School Them on Sunday night. “I really wanted to beat VG Eagles today, but we didn’t come out with our best game at all,” noted School Them coach Willis Potter. Sprauve who also had 15 kills and 13 aces, scored 12 of her 23 points in the second set, as the Virgin Gorda Eagles rolled to a 25-11, 25-8 and 25-20 triumph over School Them—comprised of primary and high teachers—who fell to 2-2 with the loss. Getting School Them together for practices poses a challenge Potter said, as some teachers teach night school and some are at the college. “Getting them together for practices is kind of difficult, but they are committed,” he explained. “Whenever they are available they are here and they are learning the game slowly but surely. It’s a new division. They’re all new players. They’re now learning to play their positions, so defensive positions pose a problem because a new player is not remembering where to be when the ball is being spiked from a specific position. The VG Eagles also defeated the RTW Vipers, 25-9, 27-25 and 25-13. Black Ops earned a hard fought five set victory over Vipers, 21-25, 25-19, 25-23, 20-25 and 16-14. Rayonne Frett led Black Ops with 22 points. Kenisha Forbes and Ariana Forbes contributed 17 points a piece. Irene Plobete led the Vipers with 19 and Jacintha Weeks chipped in another 17. The Vixens downed Black Ops in four sets, 25-16, 9-25, 25-22 and 25.23. Shermine Nibbs had vixens top score with 10 while Arianna Forbes scored 11 for Black Ops. In men’s play, Raw Power upended defending champions Gunz, 22-25, 25-23, 25-23 and 25-10, behind Carson Lewis’ 20 points. Al-Qumin Nibbs followed up with 14, Paul Mourilon was the Gunz’s leading scorer with 21 points. Norville Brathwaite added 20. Andre Pickering had 16 points and Willis Potter 14, as Justdream defeated the VG Hawks in straight sets, 25-9, 27-25 and 25-21.